I Charlemagne no rainy. 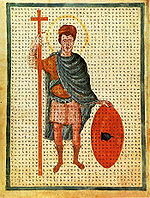 Ny vadiny dia Ermengarde of Hesbaye, Judith of Bavaria. Ny zanany dia Lothair I, Pepin I of Aquitaine, Louis the German, Gisela, daughter of Louis the Pious, Charles the Bald. Voaova farany tamin'ny 1 Febroary 2015 amin'ny 01:21 ity pejy ity.